BEIJING - The commander of the US Pacific Fleet began a visit to China on Monday in a trip aimed at strengthening ties between the two navies and gaining insight into the Asian power's military buildup. 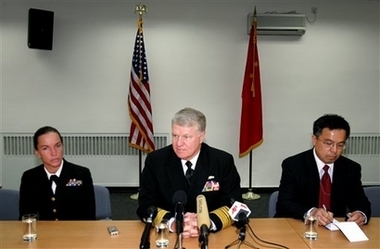 Adm. Gary Roughead was scheduled to meet with China's military officials and help plan a November 19 search-and-rescue exercise, the second half of a two-part operation that began in the United States. "The thrust of our discussions will really be in how our navies can gain a better understanding of one another," said Roughead, who was visiting China the first time since taking the post. He also told reporters he "really would like to know what the intent is in some of the developments" he's seen in the navy of the 2.3 million strong People's Liberation Army, the world's largest. Those include an expanding submarine fleet and procurement of ships that can operate far beyond China's shores, he said. "I look forward to having discussions on what the vision is and perhaps what some of the operating doctrine might be," Roughead said. In the past, Beijing has spent heavily on adding submarines, jet fighters and other high-tech weapons to its arsenal, which despite its size, lags well behind those of other major nations. Its reported 2006 budget is $35.3 billion, compared with $532.8 billion in defense spending signed by President Bush for 2007. Visits between the Chinese and American militaries dropped off after the collision of a US spy plane and a Chinese fighter jet off China's coast in 2001. Relations have been improving recently as US leaders cautiously seek to increase exchanges and better understand China's rapidly modernizing military. The top U.S. Pacific commander, Adm. William Fallon, has visited China three times since taking office about 18 months ago to boost contacts and reduce the potential for miscalculations. In September, two Chinese navy ships stopped in Pearl Harbor, Hawaii, then on to San Diego for the first part of the search-and-rescue exercise that will end this week in southern China. The November 19 mission off the island province of Hainan is still being planned, Roughead said. It will involve 400 Navy personnel from the USS Juneau.